With two sons in our household a tidy hallway has always been a whimsy. Their tiny toddler shoes were cute lined up in the hall but their hefty size 10 school shoes and trainers have less appeal. We have tried various shoe storage systems in the past but none have simultaneously ticked the practical and presentable boxes. And getting the boys to actually use any system has been a disaster. When we moved here last year we were delighted to gain a bigger through hallway for the first time. Out went the cream carpet and in came a hard wearing alternative. We spent a long time researching and discussing a small storage solution for shoes. We found several bespoke options but they were too expensive. Thinking outside the box we considered home living storage units instead as an alternative to standard shoe storage options. Unfortunately Ikea's Expedit was outruled because it didn't fit the designated space, a corner at the bottom of the stairs. Looking around for something similar we found a smaller version from a popular catalogue merchant. It fits the space perfectly and this unit has a useful back unlike Expedit. We have a fairly disciplined approach to limiting the number of shoes in each cubbyhole. Two or three pairs will fit but one pair looks better. Our other shoes are stored in our wardrobes. 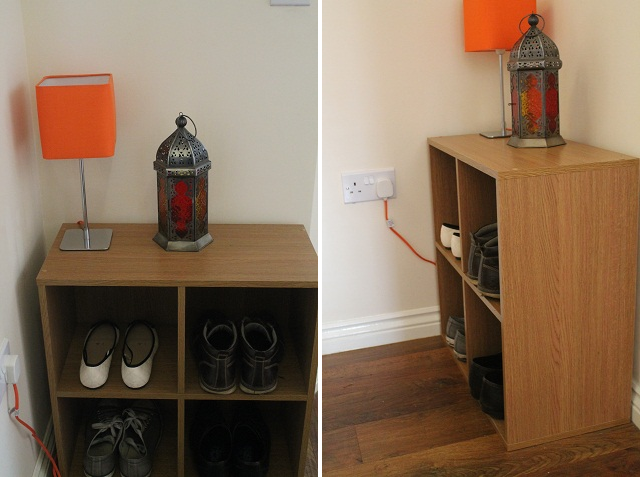 I think this unit works well as shoe storage because it's simple, neat and easy to use and the shoes can't be seen from the front door. Also, it's not obvious that this is a shoe storage unit. This corner of the hall is quite dark so the lamp and lantern bring a bit of colour even when they're not lit. This storage unit was very reasonably priced but what is priceless is that finally we have a shoe storage system that the boys use. And it's almost made to measure because the height of a cubby is just right for my favourite ankle boots. What an excellent idea, I must look into something like this. With two daughters, our hall is always full of shoes and we're always falling over them. When our children were teenagers their shoes seemed to multiple over night and the shoe rack in the under-stairs cupboard was always over flowing. Your solution looks so good and I love the floor you have choosen too. Great idea, so much neater than my shoe rack! When my son (and his size 11'S) left home, hubby and I would wander past our shoe rack (and the floor space in front of it) and be amazed by it every time - it was a thing of wonder lol! What a great idea. I like storage spaces that limit the number of things that can go into them.